Are you looking for the hottest temperature single serve coffee maker? Single serve coffee machines have stood their worth over time. These machines are sleek, versatile, durable, and offer a convenience of variety that only a coffee shop would have. Yet, you don’t have to worry about standing in lines. With less chores and cleaning involved, more choice in using your own coffee grounds or a brand pod, the single serve coffee machine has caught an unfair bad rap on serving hot coffee. Some people claim that single serve coffee makers don’t brew a hot enough temperature. Coffee Temperature: Which Single Serve Coffee Machine Makes The Hottest Coffee? The recommended brew heat for coffee is between 195-205 degrees and to serve between 153-175 degrees. This begs the question, which single serve coffee machine makes the hottest coffee and meets or exceeds the above-mentioned requirements? Let’s find out. After researching for weeks on which single serve coffee maker will brew the hottest cup of joe, fortunately, we were able to narrow it down to five models. We considered brand, quality, durability, affordability, and of course, heat. These machines are all great as they can brew water quickly to your required temperature needs. By far, this is a great bargain for someone on a budget. If you don’t have a ton to spend, but still want the luxuries of a single serve coffee machine, then I’d highly recommend the Brew N’ Go as your caffeine agitator. Not only does it brew hotter coffee than more expensive and esteemed competitors such as Keurig and Cuisinart, it does come equipped with an auto shut off for easy usage. It’s dishwasher safe for simple cleaning, and once it brews up to 182 degrees of your favorite joe, you can sip from the included 15 ounce thermal mug. The trouble with Cuisinart models are, you don’t know if you want to use them or marvel at it. Once you have begun to use the Cuisinart SS-10, you will notice a lot of great qualities aside from its hot brew temperature of 177 degrees. 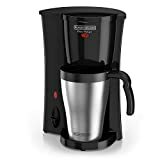 Including: The Cuisinart SS-10 is compatible with any K-cup brand, you can choose 5 sizes from 4-12 ounces, an on/off switch for convenience, and a charcoal water filter for the best quality of taste. Cuisinart is a quality brand that backs up its products and this model comes with a three- year warranty for your ease of mind. If you love technologically advanced machines, then you’ll love the Bunn My Cafe model. This single serve coffee makers has the option of running a temperature consistency. Essentially, what it does is measure the 2nd cup of joe to the first by measuring the consistency in temperature. This is to assure you that you are getting a consistent yet hot brew each and every time. And you can adjust it as well. You’ll enjoy the height adjustable drip tray, to give you more cup size option, and the fact that the Bunn My Cafe MCU Coffee Maker is equipped with auto/off and multiple settings. Bunn is highly regarded for their great customer service and durable models. This machine is easy to use and easy to clean. You can use any K-Cup or Senseo-like Pods. Enjoy a hot cup of coffee as it heats on average 190 degrees for a quick satisfying brew. While it doesn’t earn top honors as the hottest single serve coffee machine, it does measure up as the best maker on the planet with regards to single serving. Find any list of top coffee machines, and the chances are, you’ll find a Keurig right there. It comes equipped with a dazzling color display that is 2.8” big, and the Keurig 2.0 is completely versatile as it can brew either a single serving or a four cup. You’ll love the behemoth water reservoir of 80 ounces, and the fact that it takes no time in warming your coffee up to 176 degrees for a rich and delightful taste. Unlike the others on this list, the TouchPlus has a patented pending technology called the Rapid Brew. What the Rapid Brew does for you is heat up your coffee in the matter of 20-30 seconds. That is amazing brew time! It does have some other remarkable traits. A 90 ounce reservoir, which can fit a lake of water in it, numerous choices in cup size from 6-26 ounces, and the TouchPlus T526S has the option of a reusable pod for the environmentally conscious consumer. So, this gets to the question you want the answer to most. How hot does the TouchPlus brew? The hot shot single serve machine of the year brews from 200-205 degrees. And not when the water is lukewarm, from cold water. If you had concerns on whether or not a single serve coffee maker could match your temperature needs, erase those all at once. The TouchPlus doesn’t only heat it up like no other, but it also delivers in quality and taste. Drip makers are fine and all, but they don’t offer the same maximum options that a single serving coffee maker does. Not to mention, they just aren’t as elegant and sleek as the single server. The misconception of whether or not a single serve coffee machine can match up with the others in regard to high brew temperatures has been debunked. 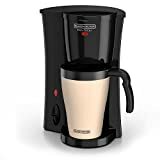 The Black and Decker Brew N’ Go is great if you are on a budget, while Bunn and Cuisinart are best known for their customer loyalty and brand quality. Of course, Keurig has been the main staple behind the single serve coffee machine market for years, and will continue to impress as they make improvements. Any one of these single serve makers would make a fine addition to your household, but if you really appreciate and need the hottest brew, your only option is the TouchPlus as the hottest single serve coffee maker.